Product prices and availability are accurate as of 2019-04-17 19:39:50 EDT and are subject to change. Any price and availability information displayed on http://www.amazon.com/ at the time of purchase will apply to the purchase of this product. 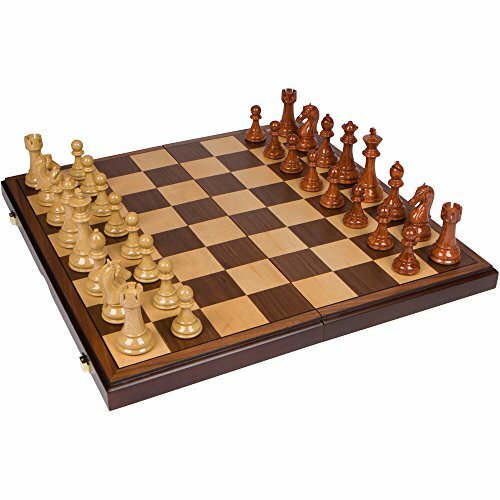 Best Chess Set's extra large, 21 inch Abigail wooden chess board brings an understated elegance to each match you play with it. It is beautifully made but isn't overly ornate to the point of distraction. It features inlaid, precision cut wood squares that are made out of Maple and Walnut wood lumber from the USA. 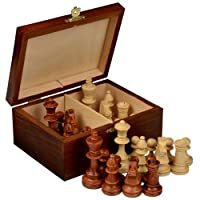 Furthermore, the board folds up to allow for easy transportation and storage of the 32 chess pieces inside the case. 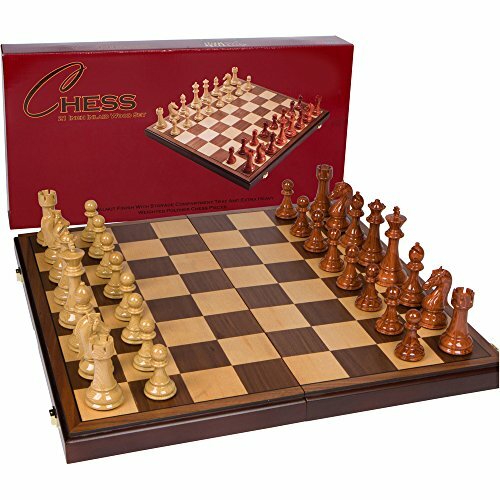 The extra heavy weighted chess pieces feel great in the hand and are carefully crafted for the serious chess player. 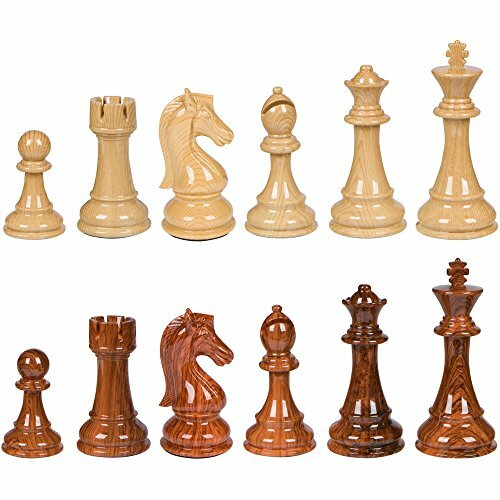 These high quality pieces are made out of durable high polymer plastic and are made to look like dark brown and light brown wood. In addition, they are padded on the bottom to protect your board. 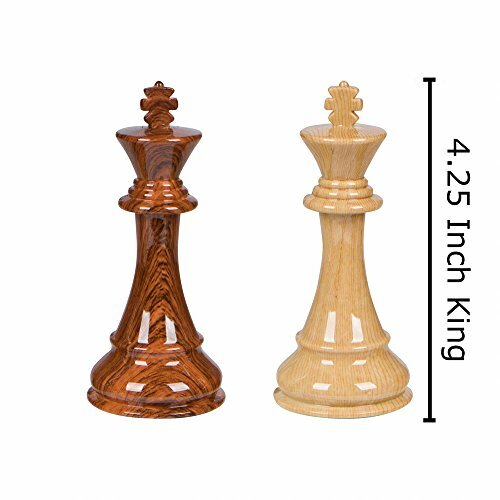 The king is 4.25 inches in height with a 1.85 inch diameter base. The total weight of this set with pieces comes in at a hefty 8.14 pounds. Please make sure to measure out our stated dimensions to see if they fit your needs before ordering. Comes in retail packaging. 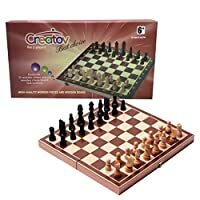 Best Chess Set® is a California based company and this product is assembled in China in our own quality controlled factory. 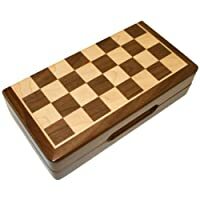 *Updated version now comes with tray instead of straps to secure chess pieces. Set: 20.75 x 20.5 x 1.38 inches (Extra Large), Playable board area: 18.76 x 18.76 inches, Individual square size: 2.35 x 2.35 inches, Full set weight with pieces: 7 lbs 12 oz King height: 4.25 in, King base diameter: 1.85 in, King weight: 3.6 oz, Pawn height: 2.25 in, Pawn base diameter: 1.38 inches, Pawn weight: 1.3 ounces Chess piece type included: High polymer extra heavy weighted plastic with glossy finish Board type: Inlaid maple and walnut wood (wood grown in USA from renewable sources) Folding case with interior storage for chess pieces. Board, complete set of pieces, and instructions included. 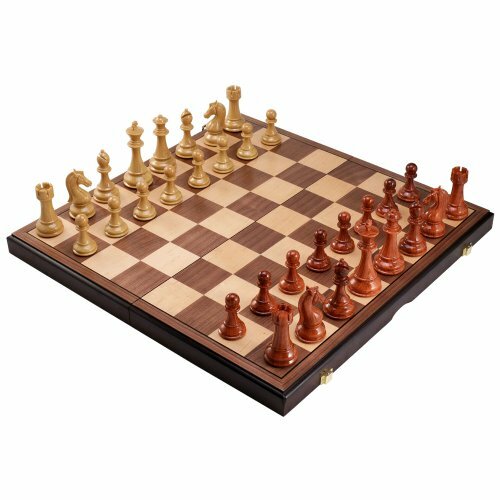 *Updated version now comes with custom tray instead of straps to secure chess pieces.